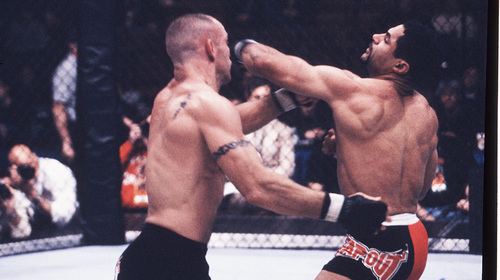 An event oft mythologized for its backstage bowel issues, UFC 35: Throwdown was headlined by two titles fights as UFC middleweight champ Dave Menne tangled with Murilo Bustamante and UFC lightweight champ Jens Pulver collided in a classic with BJ Penn. 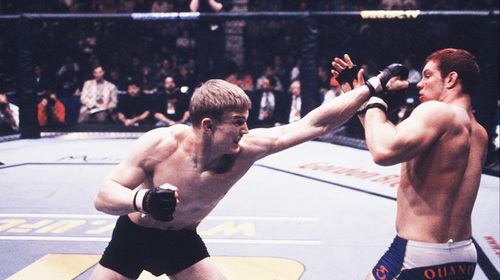 Jens Pulver vs BJ Penn UFC 35 Fri, Jan 11, 2002 (20:17) The first time Jens Pulver and BJ Penn fought it was for the UFC Lightweight Title. 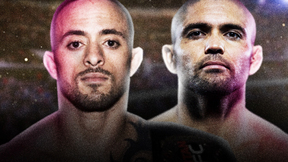 After a five round, back-and-forth battle, one fighter emerged victorious. 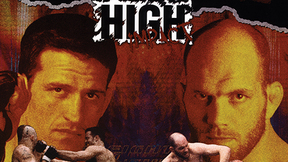 Ricco Rodriguez vs Jeff Monson UFC 35 Fri, Jan 11, 2002 (23:35) The Octagon was the staging ground for two ADCC Submission Wrestling World Championship gold medalists to clash as 11-1 BJJ blackbelt Ricco “Suave” Rodriguez faced 7-3 former NCAA Division I wrestler Jeff “Snowman” Monson. 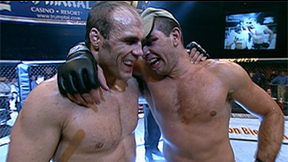 Murilo Bustamante vs Dave Menne UFC 35 Fri, Jan 11, 2002 (16:17) Two submission experts met in the Octagon when UFC middleweight champion Dave Menne defended his belt against Murilo Bustamante. 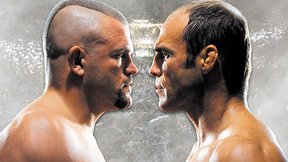 Chuck Liddell vs Amar Suloev UFC 35 Fri, Jan 11, 2002 (24:35) In a collision of stand-up specialists riding immense win streaks, Chuck “The Iceman” Liddell, who was on a seven fight win streak, was set to take on debuting Amar Suloev, who had a 12 fight win streak of his own. 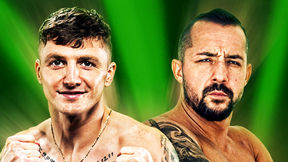 Andrei Semenov vs Ricardo Almeida UFC 35 Fri, Jan 11, 2002 (15:18) It’s a submission savant showdown as Renzo Gracie BJJ blackbelt Ricardo “Big Dog” Almeida rolled into the Octagon to square off with the UFC debuting, 21-2, Russian grappling ace - Andrei “White Shark” Semenov. 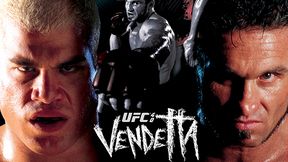 Kevin Randleman vs Renato Sobral UFC 35 Fri, Jan 11, 2002 (23:26) In his second attempt to make 205 pounds his home, former UFC heavyweight champion Kevin Randleman aimed to use his vaunted wrestling and power against Brazilian jiu-jitsu blackbelt and Marco Ruas protege with a 19-3 record - Renato “Babalu” Sobral. 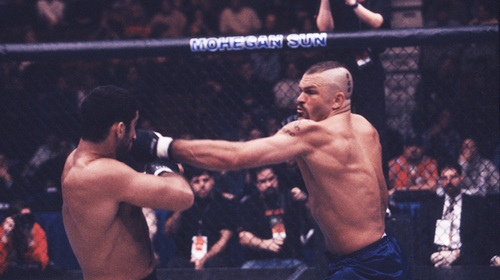 Gil Castillo vs Chris Brennan UFC 35 Fri, Jan 11, 2002 (23:53) After an unsuccessful scrap for the vacant UFC middleweight belt, former NCAA Division I wrestler Gil Castillo returned to the Octagon to try and rebound from his first loss against Brazilian jiu-jitsu blackbelt Chris “The Westside Strangler” Brennan. 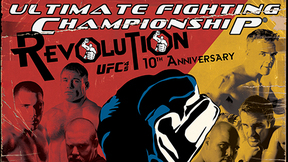 Euguene Jackson vs Keith Rockel UFC 35 Fri, Jan 11, 2002 (12:50) Not enjoying a three fight losing skid inside the Octagon, the bruising Eugene “The Wolf” Jackson took to the cage focused to get his career back on the winning track against a fellow fight finisher in the debuting and undefeated Keith Rockel.